Edutainment systems are a great way of combining entertainment and educative/interactive learning for kids. 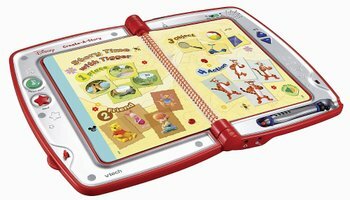 VTech's Disney Create-A-Story is a similar kind of system wherein the young ones have the power of learning and reading plus making up their own stories. Surely an electronics reader can never replace a parent sitting with the kids, but can do well as an assistant while driving inside a car. VTech's Disney Create-A-Story is a package which offers its readers 2 different kinds of books based upon A.A. Milne's Winnie the Pooh creations, namely the "My Friends Tigger & Pooh" Create-A-Story and the Read-A-Story "Tigger's Shadow of a Doubt". There is a Read-A-Story; this tale has super-sleuths Darby, Tigger and Pooh faced with an uphill task as they try to solve the mystery behind the vanishing of Tigger's shadow. This narrative permits various discovery-style games. The other one is Create-A-Story mode, upon the VTech system being connected to a PC or TV it enhances the overall experience. Handling is easy but some parental assistance could be needed.